Souffles can seem pretty intimidating and despite the fact that I had successfully made a savoury asparagus and gruyere souffle a while ago, I still had not tried sweet dessert souffle. I was looking for a nice and light strawberry dessert and a strawberry souffle seemed to fit the bill perfectly. After looking at several recipes I came to the conclusion that the base recipe for a strawberry souffle is simply pureed strawberries, egg whites and possibly some sugar to sweeten it up a bit. From there you can add other things citrus zest, liqueurs, etc. I decided to keep mine pretty simple and just went with some vanilla extract. The strawberry souffle was even easier to make than the asparagus one was which is to say that it was dead simple. You simple beat the egg whites until they form soft peaks, fold in the strawberry puree and bake. The biggest problem that I had was trying to photograph them before they deflated. The strawberry souffles were amazing light and fluffy and full of the strawberry flavour. I was quite pleased with the shade of red that I got the insides were even darker. What a really nice light way to enjoy strawberries! Mix the strawberry puree, sugar and vanilla extract. Gently fold the strawberry puree into the egg whites. Pour the mixture into 4 greased ramekins. Bake in a preheated 350F/180C oven until puffed and golden brown on top, about 12 minutes. aahh Kevin you make all beauty and yummy!! really!! waht's nice souffle, I never have made a strawberries souffles but Im sure is yummy and look nice, so nice, I love cheese souffle too! does the egg/strawberry combo taste good? Wonderful! Looks so springy and light! Made even prettier in the red ramekins! I've heard a souffle's rise is dependent on vertical brush strokes when buttering the ramekins. That kind of technicality is a touch scary! These look beautiful! I think I'm going to try this with other fruits, like maybe blueberries or raspberries. umm..Wow! Souffle is something I have always been a little intimidated to try. I think it is some sort of stigma that comes with the word "souffle", but these look delicious and you make it sound so easy. I'll have to give it a shot! Sounds easy and delicious. I've never made souffle before, but you inspire me! Very nice. and of course the colours look amazing! Cool. I've never seen or heard of a strawberry souffle before. They look great! I was seriously looking for the food coloring in your recipe. None. Gorgeous. I will try with the next Farmer's Market Strawberries I buy. Beautiful! I am linking to your blog from mine because I love it! You learn something new everyday. I've been a chef for 15+ years and have never seen a Strawberry Souffle before. They look excellent. Great job, it looks perfect! Strawberry souffle sounds so lovely. I must go buy some ramekins! Strawberry season opened here yesterday, and we're going picking tomorrow! This looks like a great way to start the season, and your ramekins are so pretty! What a beautiful dessert! This would be perfect for any dinner party. These are kinda cute. They would look super in the dinner table..
Yummm! Every time I look at your blog I find I'm craving something that has never entered my head before!!! Lovely! The souffles look lovely! Thanks for posting the recipe. I 'll definitely try this. I had souffle for the first time a few weeks ago and loved it! Making my own still seems too daunting. I really like the idea of a strawberry one with some vanilla ice cream on the side. What a great way to take advantage of the gorgeous strawberries currently in season. Looks like its low in calories too. So pretty and pink! Those look great. That looks great, perfect and delicious! What a great idea. They look absolutely delicious and I bet they just melt in your mouth. You know, I never met a souffle I didn't like! This looks so great Kevin, perfect for entertaining and very cute for children, because of the colour! I'm doing a "pink lunch" next week and now I have the dessert for it. This looks just lovely. yummmmmmmmmmmmmm!!! looks fab but next time Kevin…I expect the napkins to be ironed…lol…just kidding!!!! Ha. Another strawberry dish bookmarked. Thanks, Kevin. These souffles look amazing. 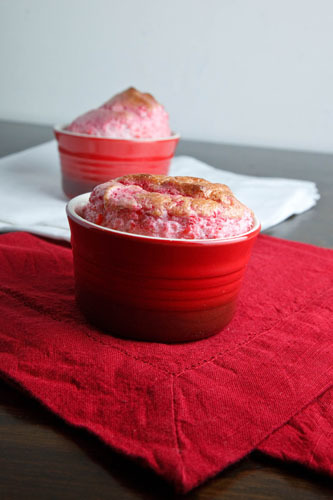 Wow – love the look of that – Strawberry souffle, what a great idea! Kevin, trust you to come up with a gorgeous new way to use up strawberries! If I wasn't so petrified of souffles (yes I know, I need to get over that), I'd be running to my kitchen with this recipe right now! Mmmm. They look luscious! Must try! I love how guilt-free this is. Can't wait to try it! You sure have conquered your fear of souffle's! I think these look perfect. I haven't attempted them either, but am considering trying since you make them sound doable. Yummm.. I have not tried sweet souffle like this! That looks very light and delicious Kevin! Excellent! Wow, they look good! I'm amazed they're so easy to make, I'll have to try this. What beautiful summer strawberry soufflés! Amazing & so lovely presented too! A summery souffle! Looks gorgeous! How pretty. I've never made a souffle but this looks so good I have to try it. Nicely done Kevin. I love the color of this souffle! I bet it tastes amazing too. I have actually never made a souffle and this looks like the perfect one to try. Love the fire red ramekins too, btw. I would love to give this recipe a try. Anything strawberry is a hit in my book! This looks like a delicious dessert – I love how few ingredients it is. Plus, I want to go strawberry picking this weekend. I've never made a souffle, but this looks delicious! Wow, anyone who even attempts a souffle is amazing in my book, and yours turned out great! Beautiful! Oh, I am the same; I love savory souffle's but have yet to make a sweet one. Those strawberry soufflés are too cute and sound delicious! Wow…I'm amazed. I've been wanting to try a souffle for along time, but I've always been intimidated by the whole baking of it. This looks awesome! Wow this looks terrific! I just started a blog for quick n' easy vegetarian and vegan cooking, with the goal of getting people to eat more veggies. Let me know if you have any recipes you'd like to contribute! I'll of course put a link back to your blog, or could just link directly. Your souffle looks great! Light, airy and I love the bright pink color. You've got some great elevation on those souffle's…good stuff! gorgeous! Nice work Kevin….souffles are one of the hardest things to make. Katie: My ramekins are 3.5 inches across and 2 inches deep on the inside. That looks amazing! Can't wait to try it!